Item #QG-TL321: 14Kt. 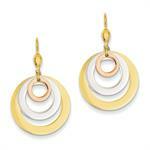 Tri-Color Gold circle earrings of 3.55 grams TW with lever backs. Item #FTJ-302: 19.5mm round 14Kt. White Gold woven earrings of 8.81 grams TW with post & clip backs. Item #SC-ERGD-114: 14Kt. White & Yellow Gold 'X' Design earrings of 2.26 grams TW with post backs. Item #QG-TH882: 14Kt. Yellow & White Gold diamond cut earrings of 2.06 grams TW with lever backs. Item #QG-TL308: 14Kt. 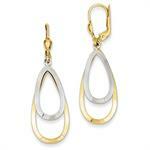 Yellow & White Gold teardrop earrings of 2.55 grams TW with lever backs. Item #RC-ER945: 14Kt. Yellow Gold fancy ball earrings of .94 grams TW with shepherd's hooks. Item #QG-A8540-TH373: 14Kt. Yellow Gold cross earrings of 2.18 grams TW with shepherds' hooks. Item #KK-ERGD-143: 14Kt. Yellow Gold dangling cross earrings of 1.38 grams TW with lever backs. Item #TBM-E67-EP4166B: 14Kt. 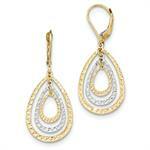 Yellow Gold horseshoe earrings with round Diamonds of .09 cts. TW and post backs. Item #SC-ERGD-0245-P1: 14Kt. Yellow Gold earrings of 1.83 grams TW with post backs. Item #FTJ-303: 14Kt. 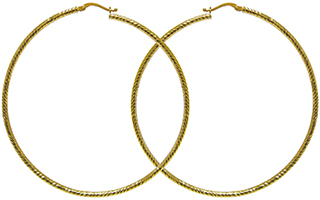 Yellow Gold twist earrings of 4.89 grams TW with post backs.